Will the owners of the proposed South End casino keep their promises to hire City residents, and will they promise to not sue the City to have their taxes lowered? No and no. I’m still horrified and disgusted by this casino proposal for the South End. But since I last wrote about it, the discussion around this casino, like the recent discussion around the Global tar sands oil heaters being imposed upon the Port of Albany, has been conducted in public among the citizens of Albany with the local politicians cast in the uncomfortable role of arbiters. That’s a lot different than the way it used to be, when all the development deals happened in a back room and the only way the public could participate was by filing lawsuits against the City. 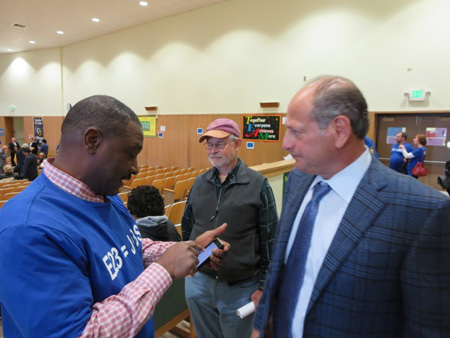 It is precisely because the casino discussion has become public that we are hearing passionate support for the proposal from a significant number of the people of the South End and from some of the people of other downtown neighborhoods. These folks want this casino to be built in their backyard because they want jobs, the supposedly good jobs and opportunities that the developers are promising. I have yet to hear one single person say that they want this casino because they want to gamble. Jobs and opportunity. That is very hard to argue against. Past City governments have so thoroughly destroyed the South End that many of the people who live here- the economic survivors- are ready and willing to jump at any substantial sounding promise of opportunity and advancement. But there is a growing suspicion that the people who are pushing this casino down our throats, Rochester speculator and Cuomo campaign donor David Flaum along with the boys from Off Track Betting (OTB) are making a big load of fabulous promises that they have no intention of keeping. 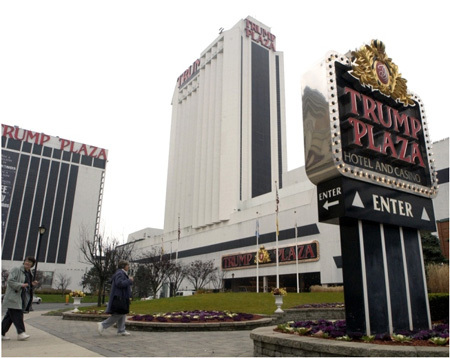 A year ago Donald Trump tried to sell Trump Plaza for a paltry $20 million, a record low price for an Atlantic City casino, but some of the major investors balked and today he is stuck with the declining property. Trump is obviously being realistic. But Trump’s investors, which include parasitic financial predator Carl Icahn, think casinos are a good investment, a bad sign for the rest of us. Reading this description of Trump Plaza as it is today, I remembered something that I had only half realized. Casinos and “legal” gambling are symptoms of decline that accelerate decline, sopping up scarce wealth from the neighborhood the same as slumlords, street drug dealers, furniture rentals, check cashing, payday loans and charter schools. It seems that my prediction that David Flaum’s South End casino will be filled with poor people, “sad wide-eyed zombies wandering around hoping for the big payoff” is most likely an easy prediction. 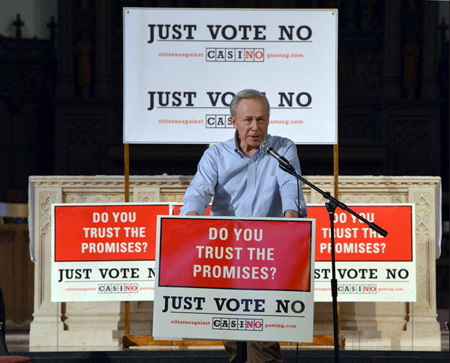 According to former Connecticut Congressman Bob Steele, who spoke at an anti-casino gambling forum at Channing Hall at the First Unitarian Universalist Church in Albany (FUUSA) organized by Occupy on May 22, decline is actually part of the business model for casinos. When the casino first opens there are indeed quite a few jobs available because people with disposable income do indeed show up to check out the shiny new facilities. For a short time it will look like all the promises by the developers will be kept. But sooner or later, usually sooner, the people with the money will stop showing up and the total revenue collected by the casino will drop off. According to Mr. Steele, that’s when most of the gaming tables and other attractions that require skilled labor will be replaced by slot machines, which require little or no maintenance. In other words, the casino will be automated as much as possible and will require only a small number of mostly low-paid jobs. It doesn’t take much imagination to realize that with such a business model there is no incentive for the owners and managers of the casino to recruit employees from our community. With such a short window of high profitability, investment in the community is pointless. It makes more business sense to import employees from far away to the Albany casino who have been recently laid off from other underperforming casinos, and send them elsewhere when the Albany casino starts declining. Which explains why when those smirking OTB boys met with the Common Council at a special meeting, they hedged and hawed and could not be pinned down when our representatives tried to get them to agree to a covenant that guarantees jobs to Albany residents. Some reports made it sound like there were serious negotiations for a jobs covenant going on, but it turns out there was nothing of the sort. Basically, behind the scenes the OTB boys were trying to wiggle out of their promises to the public. At that stormy meeting, Council members Judy Doesschate of the 9th Ward and Frank Commisso Jr. of the 15th became increasing frustrated with the OTB boys. Ms. Doesschate told me the OTB boys had a set of pre-programmed lines and wouldn’t answer questions with anything else besides patter. Mark Robinson of the 5th reportedly became downright angry with their evasions. Despite all of their public promises, it has become crystal clear that for all their big talk these clowns have no intention of providing jobs to our community if they can help it. And the one point that no one seems to be bringing up, will the casino owners sue the City to have their tax assessment lowered, and how many times will they do so? At one point I heard the OTB boys compare themselves to Crossgates Mall. Just ask any Guilderland official how many times the mall’s owners, Pyramid, have sued their town over tax assessments. 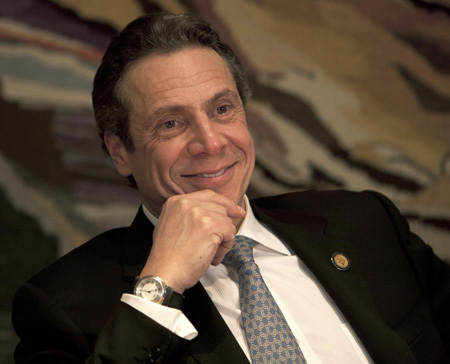 I’m not a betting man and I hate to lose money for no reason, therefore I will offer to make a small wager that these casino people will be suing Albany to lower their taxes. You’ll see. So if despite the evidence to the contrary, even if Flaum and the OTB boys really do intend to provide many good jobs and pay us fabulous taxes and community benefits, will they be able to do so? With all the new casinos popping up in the State and in the region that may not be possible. I say, if the casino does not provide good jobs to the the people of the South End and does not regularly provide a pile of fabulous tax revenue to City Hall, then this casino has no right to exist. 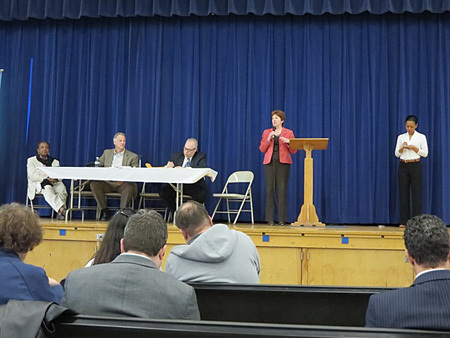 This past April 17 I clenched my teeth and attended the presentation at the Giffen Public School auditorium by developer David Flaum and his business partners from Off-Track Betting (OTB) who will be running the proposed casino. The first person I saw as I drove past the school looking for a parking space was the mayor of Albany, Kathy Sheehan. She had just parked her car across the street in the DMV lot and was jaywalking diagonally across Rensselaer Street, clutching a bag to her body and frowning distractedly. When I walked into the big auditorium a few minutes later I noted that Ms. Sheehan had entered without fanfare and was in the back deep in discussion with the local beat cop, Ben Sturges. A few minutes later she was up at the front talking up at the thick circle of corporate media cameras and lights that surrounded her. When she was done with that she sat down quietly with all the other frowning politicians sitting together in the front seats on one side. Shortly after entering the Giffen auditorium I discovered, with a shock, that there was a massive class and racial divide over approval of the proposal. To put it simply, low income people of the South End and of other downtown neighborhoods, the majority of whom are black, are strongly in favor of the casino because they see it as a provider of good paying jobs for themselves and their families. Those opposed are mostly white middle class people, quite a few of whom, but not all, live uptown. Oh yeah, like those white prison guards at Albany County Jail who drew jail time for themselves for running what amounted to an office betting pool on the fates of the prisoners. Or a few years back when the authorities discovered a massive football betting operation in a building on Allen Street (I wondered why I often saw fat white guys going in and out of the back of that boarded-up building.) “Unregulated” gambling is very illegal and vigorously suppressed, you see, but gambling is perfectly “legal” if the government and the proper designated political donors and corporations get to collect the takings. At the Giffen meeting, I stayed long enough to listen to David Flaum give a nauseatingly patronizing presentation full of nonstop promises. He repeatedly mentioned the taxes and “community benefits” the casino supposedly would be paying, “Five million dollars, ten million dollars, twelve million dollars!” Those three numbers, like a chant. No context, no explanation what these numbers were supposed to mean except that this was an opportunity that we had to grab at once without thinking or we would lose the big payoff. He talked to us like we were a bunch of brain-damaged children. I suppose, as a longtime Republican Party activist, donor and fundraiser, Flaum is accustomed to talking down to the public like that. 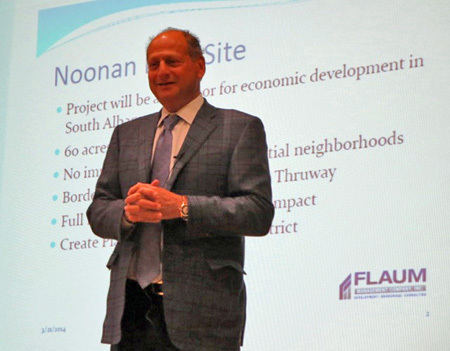 But obviously Flaum is a clever guy, he realizes that the only way he could sell the casino proposal to the citizens and politicians of Albany is with the jobs and tax revenue angle. Divide and conquer. Flaum also brought along some blank faced character with a bald head and glasses that he introduced as his personal psychiatrist. This guy’s job, apparently, was to sit there and confirm that obsessive gambling is not a mental disease, or rather, as he explained, not much of one. Common Council member Judd Krasher reported on Facebook that this clown actually walked up to him and made threats if Mr. Krasher didn’t change his opposition to the proposal. I wonder if anybody else was threatened by this creep, but did not have enough courage to go public like Mr. Krasher did. At no point have I heard Flaum or the OTB boys so much as allude to the allure of gambling, the “Hey, you never know” routine. All we heard was jobs and taxes. I’m told by someone who knows the history that this was how the Indian reservations were sold on the first State casinos. And it is a matter of record how the Indian casinos have created numerous problems and conflicts for the reservations while only benefitting a narrow band of insiders who pocket most of the revenues. 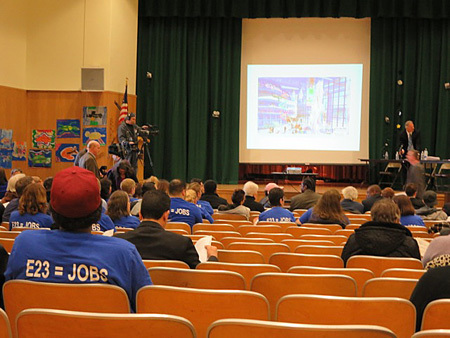 At that Giffen hearing, during the question and answer period, a certain fellow who fancies himself a neighborhood leader explained to us in exquisite detail how the casino ought to have a Dutch theme, with giant tulips and wooden windmills visible from the Thruway. Lots of frozen smiles on the podium. At that point I was ready to start screaming incoherent curses, so a lot of people noticed when I got up and left cursing. Sometimes there’s only so much I can take before I become disruptive. 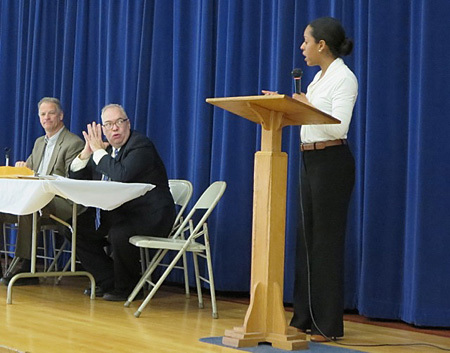 A week later I attended a First Ward public meeting around the corner from my house at Bishop Maginn Catholic middle school. In all these years this was the first time I’d been inside this building, which is very underused and may soon be closed. The Catholic parochial schools have lost students partly because Catholics with enough money to pay the hefty tuition have left the City, but mostly because the quality of education in the Albany public schools has vastly improved these last 20 years and has attracted more students. Meanwhile the for-profit charters have selectively poached students from both the public and parochial schools, a policy which has devastated the struggling parochial schools. David Flaum was not present at Bishop Maginn, we were told that he was busy pushing some other casino proposal downstate in Orange County. So we had to make do with the OTB boys and Flaum’s psychiatrist. Once again the mayor and much of the Common Council was present, the stormy meeting with the Common Council had taken place the night before and no doubt the members present wanted to gauge how public opinion had evolved in a week. The mood among the public at Bishop Maginn bordered on ugly. It was interesting to watch the smirks on the podium turn into uh-oh faces as one speaker after another questioned the value and stability of the promised jobs, and suggested better uses for the land in question. It was heartening to see how many of my South End neighbors have developed the courage to stand up in public to defy self-important authorities. 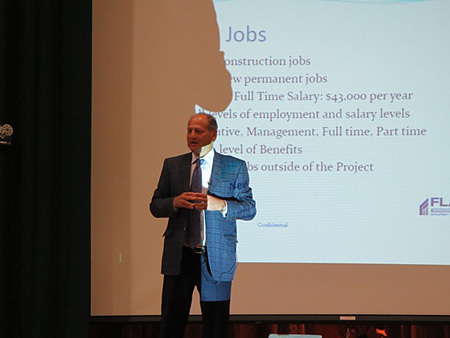 I got the only sustained applause of the night when I told the crowd that the casino was a money extraction operation, and that it had no right to exist unless it provided good jobs that are guaranteed to go to Albany residents, and in particular citizens of the South End. (Which I’m glad of, when I open my mouth I’m never sure what is going to come out and how it will sound.) Naturally the OTB boys did not directly reply to my comments, and I didn’t bother to press them. After all, I wasn’t talking to them, I was talking to my neighbors. We have to remember that last November, when that extremely skewed ballot measure to “allow” casinos by amending the State constitution was passed Statewide, it lost heavily in the City of Albany. The majority of Albanians, despite the slanted wording of the proposal, wanted none of it then and want less of it now. Remember the ballot measure? That is not neutral wording appropriate for an election, this ballot proposal was worded to influence the outcome. 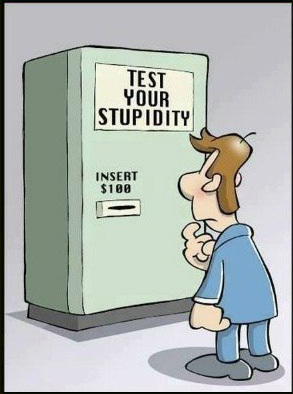 If it was a public polling question it would be classified as a push poll. It was also a pack of lies. It was in fact classic doublespeak, the actual words of the ballot measure saying the exact opposite of what is real (War Is Peace, Freedom Is Slavery, etc.) As far as I’m concerned, the Constitutional amendment that allows the imposition of casinos by the State government is illegitimate. But while a number of folks almost immediately organized to support the casino for the apparent jobs that it would bring, there is a growing widespread movement organizing to oppose the proposal. This is the kind of thing that representative politicians don’t like, when their constituents are divided down the middle then that leaves them similarly split. Who should they represent, and who should they alienate? 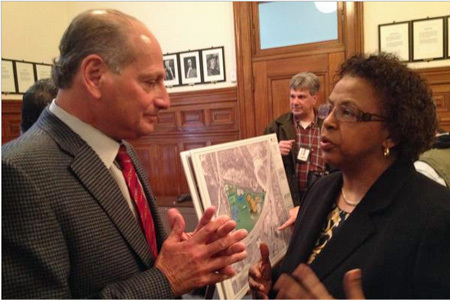 The downtown Common Council representatives are hurting the most. 1st Ward representative Dorcey Applyrs and my own 2nd Ward representative Vivian Kornegay are very aware that gambling and casinos impoverish communities. They both understand that the fabulous promises of jobs and taxes are just so much horse pockey, but they also understand that their job is to represent their constituents. If the constituents are loudly clamoring for an opportunity to have their heads smacked with a hammer, what should a representative do? It’s important to note that the legislation allows only one casino to be built in the Capital District, and the municipality in which it will be built has to formally ask for the casino. (“Please hammer our heads.”) The OTB guys claimed that the “E23” proposal in the South End is the most ideal site in the region and thus most desirable, so possibly Albany is where they will be applying the most pressure. But as of this writing the only Capital District municipality to approve a casino is East Greenbush, a low income suburb off the beaten track, which is clearly not the first choice of the casino developers. The big enthusiastic supporter of this casino on the Council is old boy Dan Herring of the 13th Ward located way up town, the longest sitting member of the body. I’ve been looking at him and wondering where his enthusiasm comes from, perhaps Herring is expecting a reward for advocating for a boondoggle that will be located far from his ward. Going along with Herring is his fellow uptown old boy Joe Igoe of the 13th, old party operatives Jack Flynn of the 8th and Ron Bailey of the 3rd, and from what I’ve seen it looks like Richard Conti of the 6th has convinced himself that a casino will bring the City more revenue than it siphons off. The rest of the 15 Council members are either vehemently opposed or officially undecided because of support by a significant number of their constituents. Meanwhile mayor Sheehan looks and sounds incredibly unenthusiastic as she touts the proposal. She rather resembles a kidnap victim on a video reading a prepared statement from the kidnappers, please drop off the cash and free the prisoners or they will start mailing my digits to news outlets. Really folks, we have other things to worry about, we don’t need this idiotic distraction. Like for instance, I recently found out (from someone who is familiar with the oil transport process) that the explosive oil trains that Global and the fracking outfits are imposing upon us don’t have to be explosive. It seems that the oil corporations are supposed to let the oil sit for a bit before loading it on the trains so that the explosive gases, such as propane, can be siphoned off. What’s happening is that the corporations are loading the explosive gases onto the trains along with the oil. Rather than reduce their profits a tiny bit by eliminating the risk to expendable people like those of us who live in Albany, the corporations involved are more than willing to endanger and eventually sacrifice our City because, well, the people who run the oil corporations are a bunch of irresponsible psychotics. 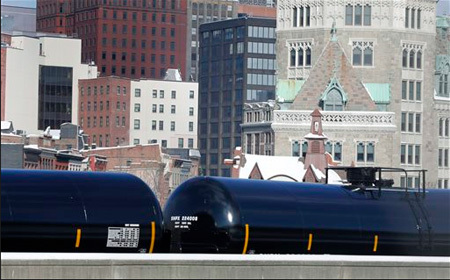 Understand that folks, the oil trains don’t have to be explosive, and no amount of upgrading of the tank cars will make them safe as long as the corporations continue to refuse to carry out preliminary refining before loading the tank cars. And let’s not forget the vacant building crisis, the gun violence crisis, the Jerry Jennings deficit crisis, the unmet demand for housing crisis, the impoverished 37 percent of Albany citizens crisis, the tax exemption revenue crisis, the Rapp Road Dump garbage crisis, the aging sewer system crisis, and a bunch more crisis that we’ve had for so long that we hardly notice them anymore. 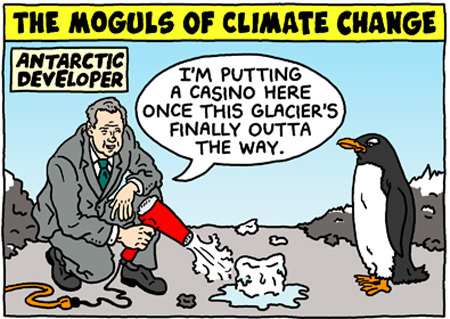 Think of this casino proposal as the equivalent of a quack cure for cancer. Despite the extravagant claims by the developer, this casino will not quick fix our dire problems. So the Albany Common Council has a deadline of June 30 to decide whether or not we should ask for a casino to be located here in the South End. If we end up saddled with this boondoggle cash extraction operation, then the best we can hope from the deal is that the casino will not make worse the many problems that our City is trying to solve. Is that all we want for ourselves? Is a sleazy casino full of slot machines all that we deserve? If for no other reason - and I had plenty of others - I opposed the proposition because the wording was SO biased. Oh, below, the word correctly is spelled incorrectly the first time! Dan, I agree with your analysis and observations, but for the life of me I can't understand why you keep giving the mayor a pass... If the proposed casino is a "cash extraction" business and a horrible plan for Albany (I agree), why wouldn't a "progressive" mayor denounce it publicly as such? Why cut deals or (supposedly) be subservient (you have implied that much) to the corporate whore chief exceutive officer of our State? At some point, progressives will have to take a stand against those who continue to highjack "progressivism." If this casino actually gets built, the people that will actually operate it, the Chickasaw Nation of Oklahoma will be responsible for hiring local people for employment. David Flaum and OTB just want to build it. Why don't you ask the Chickasaw Nation all of these hard hitting questions??? What's wrong with portraying Albany's Dutch history????? It was originally a Dutch colony after all. 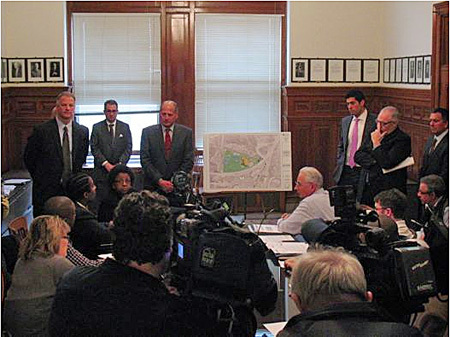 I think that deep down Mayor Sheehan really wants the casino. Yet she has to give the appearance of being forced into the deal and holding her effete nose up in the air to satisfy the 7,000 "progressives" that actually elected her to office. Oh, I can't tell how flattered I am that you cited my comment in the above post. The peeps are still gambling away on the sidewalks of the South End......hurry up and build the casino so they have a safe place to gamble and achieve the "dream"
"anonymous"- You're flattered that I called you a numbskulled troll? You're very welcome. Well, congratulations you got your wish. Instead of looking out of your backyard and seeing a casino all you have to do is walk half a block to Morton Av and look east. Who knows maybe Rensselaer won't get a casino either. But if it doesn't it won't be because they were dithering around looking for a "pie in the sky" guarantee like Albany was. A casino in Albany wouldn't have fixed all of it's problems but it would have gone a long way towards filling that budget gap. Now instead of reaping benefits and problems from a casino built in Albany, Albany can only look forward to traffic headaches if the casino is built in Rensselaer. But do you know what the bet part is??? When the casino gets built in Rensselaer, Albany residents can look on with envy....... And when they get mad and look to place blame..... they can look to the current "progressive" administration, you can't even blame Jennings for this screw-up. Sheehan will pay a price for this down the road. A lot of Arbor Hill and South End residents were looking forward to applying for jobs at this casino and now it'll never happen. This is actually the second time Flaum has abandoned a casino site proposal. Flaum and the OTB Boys had no intention of keeping any of their promises to provide jobs and revenue to the City. With casinos (existing and planned) in a number of communities throughout the northeast, market saturation can't be far off. Casino gambling won't rescue a failing economy.